I hope this is in the right forum. I've searched all over Google for something as well as this site, please help! When was this manufactured? Copy the "IMG Code for Forums & Message Boards" from where it says Grab Your Code on Tiny Pic and paste it here as I have done for you this time. Sorry, can't help any more than this. Good luck. The same mark appeared in this forum almost a decade ago, but no response. The eagle mark looks Mexican, but not official Eagle mark used in Mexico. An image of the whole item may offer more clues. Probably won't help here, but on that G****books site (can't link here due to commercial status) there is US Senate documents for 1892 with lists of names and their trades. There are numerous silversmiths and some engravers. One Francisco Guzman is turning up as a merchant in dry goods and other areas, but not as a silversmith. But maybe he is a retailer? he was in Tehuantepec, Oax. I wonder if we can entertain a Phillipine orgin due to Spanish surnames? Sorry I couldn't reply sooner, thank you for the help so far! As requested, I posted a whole pictures of the item. I apologize, I don't know what commerical website you were referring to for the book. Also, my piece doesn't seem to have an eagle Mark, although it had electronically been tested for coin silver. GoogleBooks...searching Silversmith F. Guzman brought up the documents there, even though he was not one of the silversmiths listed but rather a retail businessman. As far as the eagle stamp associated with the original F. Guzman entry, we are not yet sure what that means but it might link his name to period in Mexican history which could narrow the time frame for searching. Do you have any suggestions for avenues to pursue for this piece? I'm out of ideas since I'm such an amateur at this. 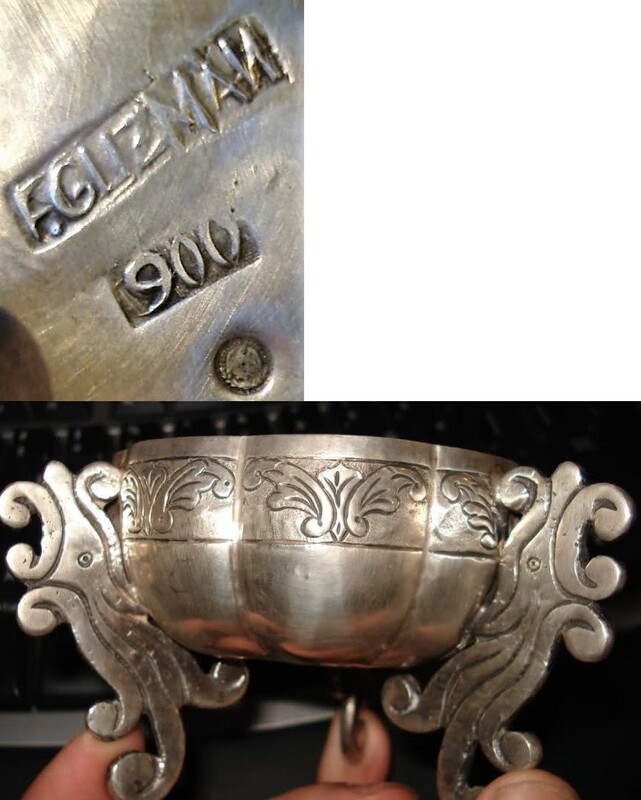 I just found an article on a Marina Guzman who says she comes from a family of silversmiths. Any tips on researching silver from Peru? Her father was Don Jacinto Guzmán,(1908-1982), not ‚‚F ‚‚ Guzman‚seen in your mark. Yes, I did see that, but what I'm wondering is someone that may predate her father. Is anyone aware of any resources to research Peru Silver in particular?